Need Branded Packaging or Custom Printed Packaging? Whether you have an established bakery that has lasted through the generations or you've just started a new upscale bakery with ideas as fresh as the bread coming out of the ovens, MrTakeOutBags.com can be your one-stop-shop for foodservice packaging. Pie Boxes, Cake Boxes, Cupcake Boxes, and Sheet Cake boxes available in brown kraft, white, and printed patterns and designs. These premium Cupcake Boxes feature a semi-gloss varnish, easy one-piece construction, and a clear cellophane window to help you show off your baked goods. The heavy-duty handle bags offer a fresh version of take out bags that are perfect for the market, take-out businesses, bakeries, and retailers. These bags are available in three different sizes in both natural kraft and white. Customize your bag with your company's logo for that personal touch. Choose from over 15 styles and sizes from our Bakery Bread Bag collection. Check out our wide selection of Paper tin tie coffee bags, available in 1/2 lb to 5 lb sizes with or without windows. Show off your treat with our NEW Window Candy / Bakery Bags. These grease-resistant kraft bags are ideal for many foods! Try one of our Die Cut Handled, Flat Bottom Take Out Bags, available in two sizes and three styles including Natural Brown Kraft, White Paper, and White Gloss. Our Glassine Bags are available in 10 vibrant colors and come in three sizes including: 1/4 lb bags, 1/2lb bags, 1 lb bags. An economical, untreated, and NON-grease resistant alternative to some of our other grease resistant and waxed bags. Available in multiple sizes of both natural kraft and white. Our grease and moisture resistant paper sandwich bags are available in two sizes and styles, including Natural Kraft and White. Extensive selection of grease resistant brown or white paper, standard brown or white lunch type bags, or an array of colors in many sizes. One of the most versatile shopping bags on the market, the paper shopping bags are a great choice for take-out and carryout applications. Select from natural kraft, white, color boutique, and design print from a line of the strongest and most cost effective materials. Flat and looped handles available for convenient carrying. Choose from multiple styles of plastic shopping bags including die cut handle, rigid handle, or soft loop handle bags in a variety of sizes. We also stock recycled plastic shopping bags. Shop our FDA approved Clear Cello Food bags in a wide range of sizes including flat or gusseted styles. With our different sizes and styles of baking cups including Brown Kraft and Round Fluted cups, you'll be sure to find an ideal baking cup that fits your bakery or restaurant's needs. The sleek Solut! Black Pizza trays are a chic way to show your specialty pizzas on the go. Trays are available in 13" dia., 15" dia., and 17" dia. This oven-safe pan liner eliminates mess and prevents your goodies from sticking to the pan. This reusable parchment paper is a great addition for any kitchen to help reduce cost and clean up time. These disposable baking trays are the perfect addition to any baker or chef on-the-go. Reduce your clean up time and costs with one of our baking trays, available in Black and Brown Kraft and various sizes. Quickly and efficiently wrap up and grab your food using our Food Wrap Dispenser Boxes. Available in Brown Kraft, White, Pink, and Chocolate and in three different sizes. Try one of these versatile, reversible clear bowl and lid food containers, sizes include: 8/12 oz bowl with matching lid, 16 oz bowl with matching lid, 24/32 oz bowl with matching lid, and 48/64 oz bowl with matching lid. The perfect serving tray line that is suitable for any type of event, with the ability to hold all your different creations. Trays are stackable for secure transportation in addition to many more amenities. Step out of the box with our rectangular and square Sabert Serving trays. Take a creative angle on your food presentation with this great collection of serving trays for all your catered events. Want a more eco-friendly option or a more upscale, glossy option? SOLUT! 's line of catering trays give you the option between their natural kraft trays and their black gloss trays. Choose which is best for you! Add a simple touch of elegance with our Sabert Silver look platters and round dome lid collection. Platters available in two oval sizes and one large round size, able to accommodate all your foods. Impress your guests with the best quality of disposable napkins that come as close to linen cloth as possible. Flat-Fold Dinner Napkins, and 1/8 Fold Dinner Napkins. Choose our most eco-friendly napkin, EarthWise 100% biodegradable dinner napkins available in Beverage Square Napkins- 10" x 10" and Dinner 1/8 Fold Napkin - 15" x 17"
The Tork Universal XpressNap dispenser napkins are the ultimate single-ply napkins for any bar, restaurant, or business! Reduce consumption while being green friendly! Entertaining for a cocktail hour or small get together? Serving hors d'oeuvres and other finger foods? Our appetizer plates are the perfect product for entertaining. Enjoy one of our clear dessert dishes that will effectively show off your delectable treats, styles including: Clear Dessert Dishes with Reversible lid and bowl, Disposable Dessert Dishes, Matching Lids. Sizes vary with style. Three great FDA approved styles available for all your ice cream cup needs, styles including:	100% Biodegradable Planet + Paper Cups, Plain White Paper Cups, and Huhtamaki "Street Side" Design Paper Cups. Get to know us on social media for sales info and more! We serve you from our 24,000 square foot central warehouse in Pittsburgh, PA and through multiple distribution centers throughout the United States. Helpful information, recipes, packaging ideas, and more! Thank you. Your email is already in our system. Thank you. Your email has been added to our newsletter system! There has been an error in processing your request. That probably means you're already signed up for the main newsletter. Need Custom Packaging or Branded Packaging? Your best bet for help is to call us! Experience has taught us that the best way to move forward with something like this is for you to call in and speak with one of our packaging advisors. They can discuss your sample request with you, and may even have an additional product suggestion or two. Experience has proven that talking directly to a rep over the phone is the best way to communicate regarding Custom Printed Packaging. Call us and we'll walk you through what's needed, step by step, person to person. If you can't talk right now, head over to our Custom Packaging Section, pick a product, and fill out the form. Most of our items ship from our Pittsburgh, PA warehouse - however sometimes we will ship from our sister warehouses in other locations, which can alter shipping times. 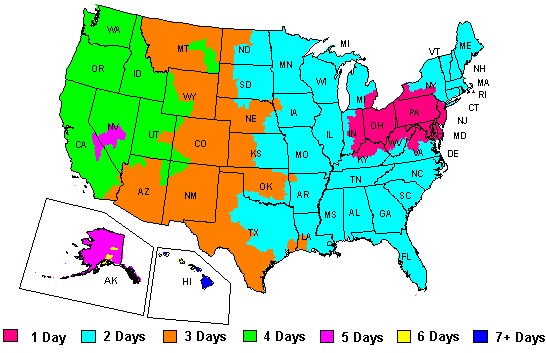 For most orders, you can refer to the FedEx shipping times map below. If you need products by a specific date, please don't hesisitate to call us and confirm. Other Issue? Message us (click here). Success!We will typically respond within 24 hours, or Monday if you leave a message on the weekend.